This cute pup just heard it's your nephew's birthday, and can't wait to wish him a fun celebration and a "paw-some" year ahead. With an adorable paw print & bone background, this card's the perfect choice for any age, and will make him feel like top dog knowing you remembered. If your nephew loves to have fun, then this birthday card would be perfect for him. It will also let him know you are hoping he has an extraordinary birthday! The image displays a funny image of a cat doing something out of the ordinary, skating, and it looks like he is in outer space! Your nephew will love this birthday card and think it is cool. Send this cat on his way to wish your nephew and extraordinary day! 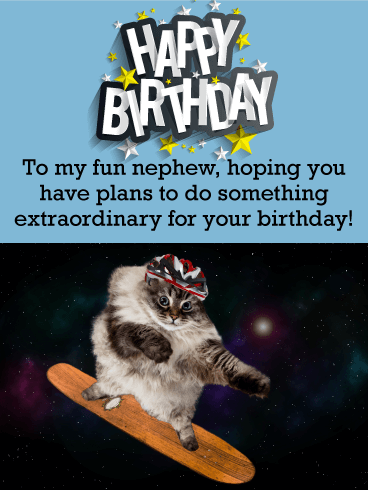 Let your nephew know he is the star of this very special day by sending this great birthday card his way! It features a starfish wearing sunglasses and this will certainly get a little laugh out of your nephew. He will really appreciate that you were thinking of him on his birthday and cared enough to send the very best. 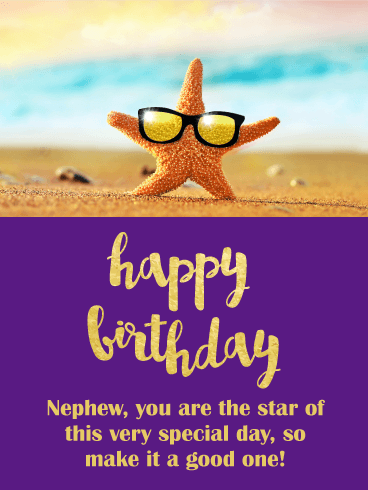 So let this starfish wish your nephew a happy birthday right away! This birthday card is awesome and your nephew is going to love it! 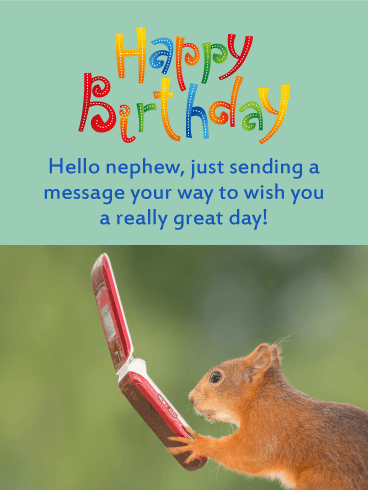 It features a squirrel using a phone which ties into the words that let your nephew know you are sending him a birthday message that wishes him a great day! It displays colorful artistic lettering that says happy birthday and it adds a festive look to this birthday card. 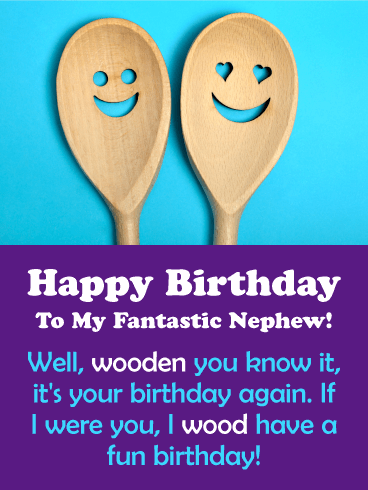 Send this birthday card off to your nephew to give him a good laugh on his special day! 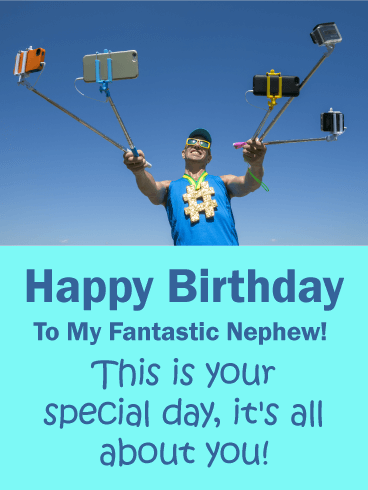 If your nephew has a clever sense of humor, then he will enjoy this funny birthday card! It features a play on words that refers to the image of the happy looking wooden spoons! It also displays wonderful colors of blue and purple that add to the overall design of this birthday card. 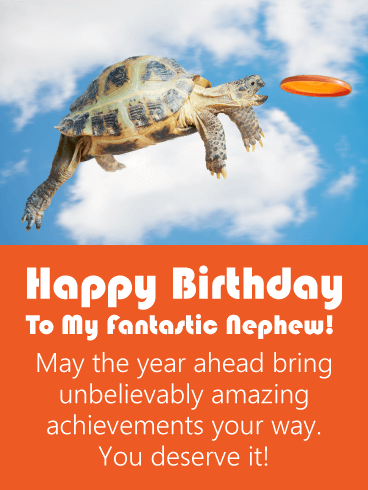 Don't delay, send this happy birthday card to your fantastic nephew so he can enjoy it on his special day! Send this inspirational funny birthday card over to your nephew for his special day. He will certainly think the dog wearing the birthday hat is humorous! This birthday card will remind your nephew that he can break through the barriers to accomplish his goals for the year ahead! It displays colorful lettering and has a festive look to it. 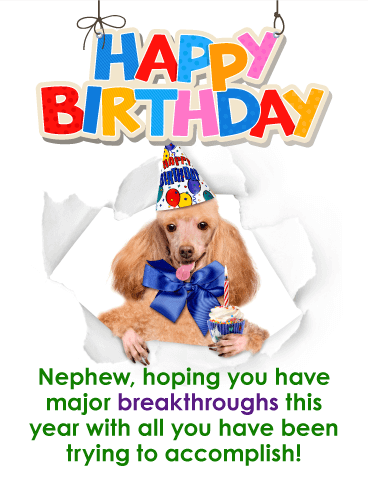 Send this birthday dog over to your nephew to get him off to a great start on his birthday! Let your nephew know that this day is all about him, and it should be since a birthday only comes around once a year! This birthday card features a man taking 5 pictures of himself at once, which ties into the message of making it all about him! This funny and interesting image will make your nephew laugh! 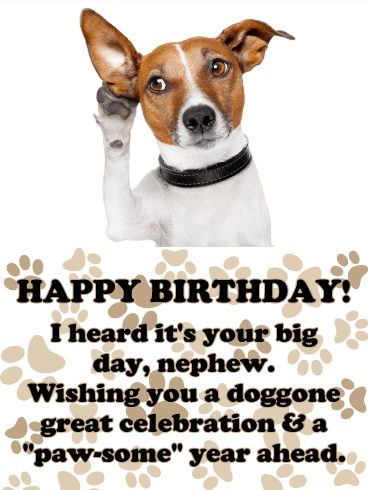 Send this humorous birthday card off to your fantastic nephew to wish him a happy birthday today! This colorful and funny birthday card would be perfect if you are looking for something entertaining to send over to your nephew! 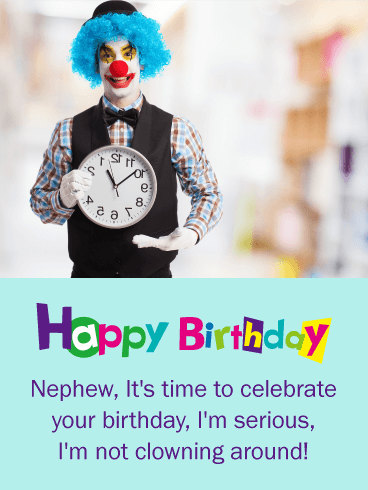 It displays a clown holding an upside down clock with a message that states that it is time to celebrate your nephew's birthday, along with mentioning that he is not clowning around! This birthday card will brighten your nephew's day, so send this clown on his way without delay! 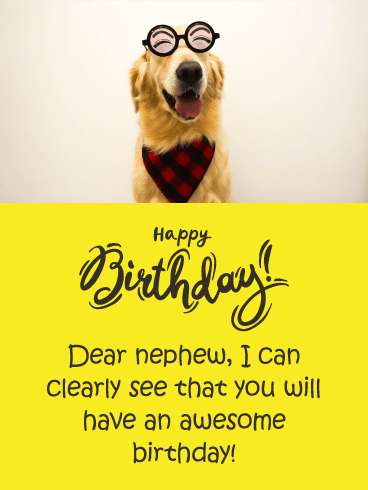 If you want to send the best birthday card ever, then send this cute and funny happy birthday card over to your nephew for his special day! 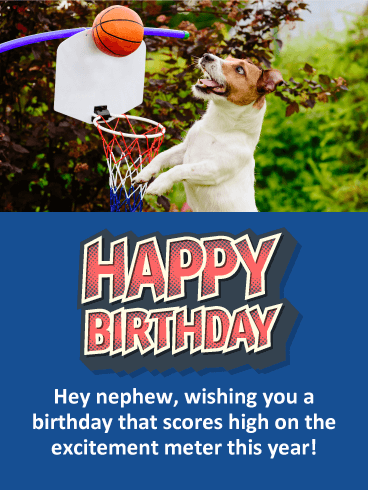 It features a dog wearing glasses with eyes, and he can clearly see that your nephew will have an awesome birthday! The creative happy birthday lettering adds a fun element to this birthday card, your nephew is going to love it.